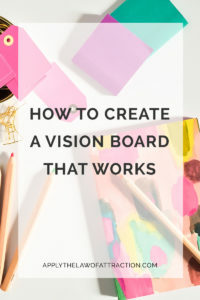 How to Create a Vision Board that Works - Vision Board Notebooks Too! A vision board is a tool to help you use the Law of Attraction to bring your desires to you. By surrounding yourself with images of what you would like to be, do, or have in your life, you begin to focus more of your thoughts on those images and to add feelings to them, thus allowing your life to change so that it matches those images. 1. Go through the magazines and cut out pictures or words that you like. Think of anything you've ever desired as you go through the magazines. For example, what kind of car would you like to have? Where would you like to live? Where would you like to visit? What would you like to do? What would you like to wear? 2. Go through the images you cut out and pick out your favorites. Trust your intuition. If any no longer feel good to you, put them to the side. 3. Begin to lay your favorite images on the poster board with the picture of you at the center of the board (all other images go around it). You might decide to put the images in different sections, such as job, wealth, relationships, and health. Or you may decide to put them all over the place in a giant collage. Trust your instincts. 4. You can also use pictures of you doing activities that you want to manifest or use magazine pictures to create images of you doing those activities. For example, if you have a magazine picture with a person on it, you can replace the head of the person in the picture with a cut out of your own head so that when you look at the picture it looks like you're the person in the picture. This step is key to making your vision board work better! 5. Glue the images to the board. If there was an image you were looking for, but couldn't find, draw a picture of it on the board. Feel free to write on the board and decorate it however you desire. 6. Place your vision board somewhere you'll see it often. Popular places are next to a bed, in a kitchen, and in an office. Instead of a vision board, you can also create a vision board notebook. Simply get a notebook or journal and decorate the individual pages just as you would a vision board. You can make each page an individual collage devoted to everything you want to manifest or you can divide your vision journal into sections with a set number of pages devoted to job, health, finances, etc. Making a vision board is easy. To make it work, simply have fun. Enjoy the process of creating it. Feel good whenever you look at it. And see it as if it has already happened – like it's a snapshot of your current life. If you'd prefer to make a vision board you can watch as a movie on your computer, iPad, or smartphone, Mind Movies is a program I like to use. The first mind movie I made was for a trip to Ireland. It took less than a month for a 2-week trip to manifest for me. Mind Movies is currently giving away 6 free pre-made mind movies when you register to watch their free video on the secrets to manifesting with Bob Proctor and Natalie Ledwell. Have fun creating your vision board!